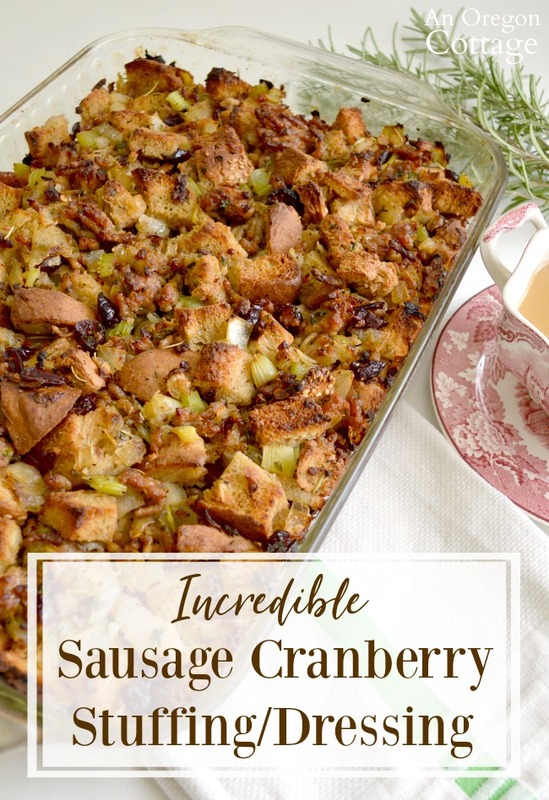 Our family’s holiday favorite, Sausage Cranberry Stuffing Dressing, is made with fresh crusty bread and has the perfect sweet-savory balance that is to die for. It’s time to leave the boring stuffings behind! 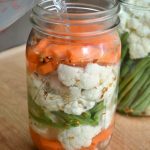 This recipe is one part of our family’s simple homemade Thanksgiving – you can see the other recipes (and decor) we use on AOC’s All Thing Thanksgiving page. You know those recipes that are probably not the best for you, but are so delicious they take a place of honor at every holiday meal? That is this recipe for sausage cranberry stuffing dressing. We eat healthy the majority of the time in order to have special dishes like this. Thanksgiving just wouldn’t be the same without it – and I’m hoping by sharing this, you’ll join us, too, since it really is incredible. 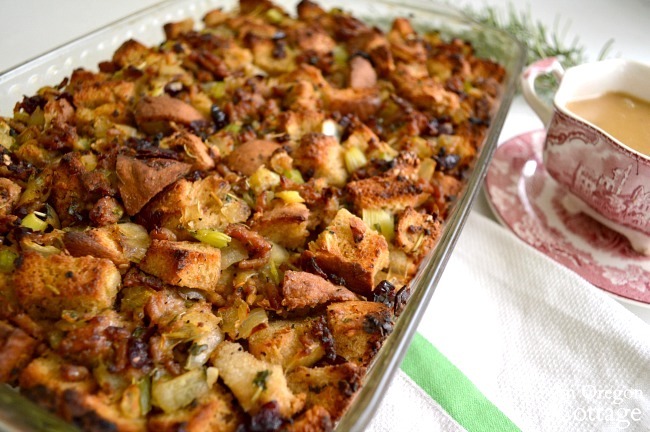 Notice how I’m calling it “stuffing dressing?” I never know whether to call this recipe a stuffing or dressing. I’ve always called it a stuffing, though because I don’t ever actually stuff a turkey with it, I know I should be calling it dressing. But then will people think I’m talking about salad dressing? I gave up and just started calling it both. But mostly we just call this our family’s favorite holiday side dish – one we look forward to all year, obviously. I never stuff the turkey because it’s a pain, frankly. It also takes longer to cook a turkey when stuffed and the stuffing is then really too moist and clumpy for me (here’s the turkey recipe I make the most – it produces an amazing gravy!). 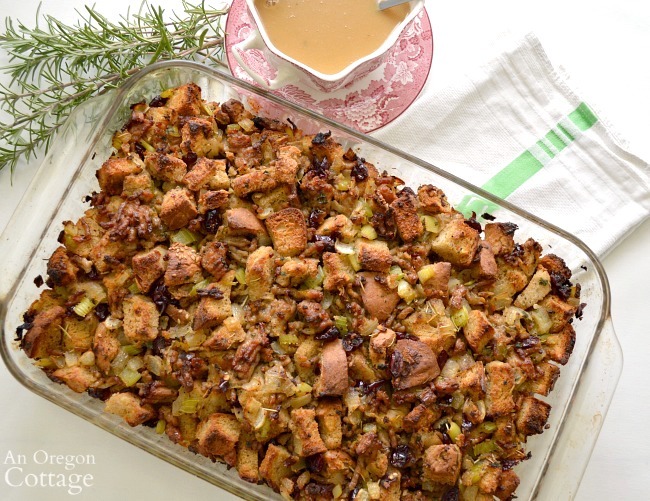 Baking this sausage cranberry stuffing dressing in a shallow pan produces a lovely crisp, crunchy top that is perfectly contrasted with the moist interior. Each bite is full of savory onion, sausage and homemade bread with just a touch of sweet from cranberries and a non-traditional ingredient. 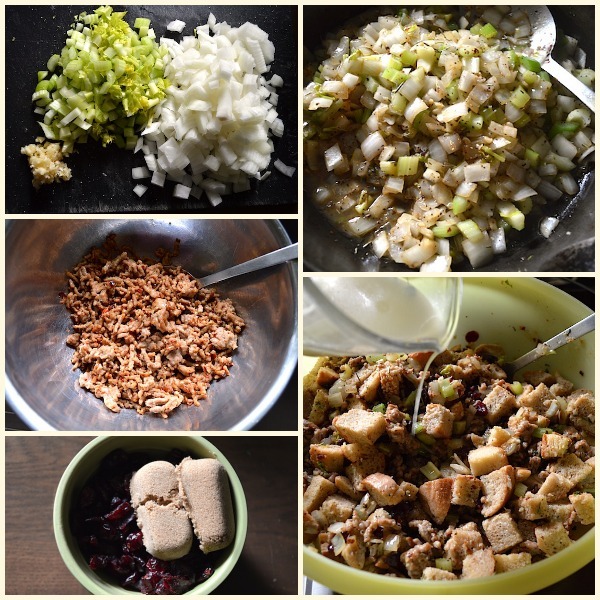 My recipe for sausage cranberry stuffing dressing is based on a much more decadent version that Brian’s cousin is known for in our extended family (it seriously is the thing we all talk about every year at the holidays, it’s so good). And while I don’t have it in me to use the same amount of fat and sugar that he does, I certainly enjoy eating it when he serves it! 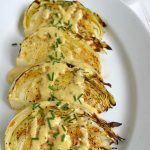 My version is a little less indulgent, but I think keeps the great flavor balance between sweet and savory. 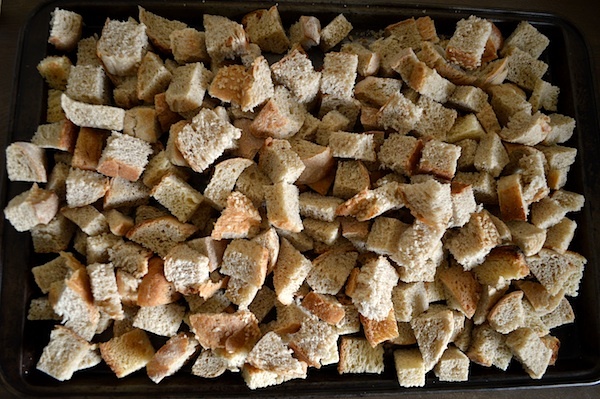 The key ingredient, I believe, is using a quality bread – no dried, old packaged little cubes here. 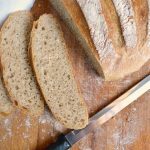 It’s perfect with Easy Artisan Bread and also really good with Easy Sourdough Artisan Bread. 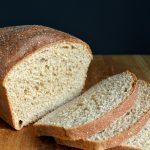 But you don’t have to use homemade bread, any good crusty bread will work. And I don’t bake it or leave it out for hours to dry, either – just a bit of airing while I make the other ingredients. I think fresher is better. The ingredients include stuffing basics like onion & celery, plus sausage (we like it hot – it adds a nice spice), garlic, cranberries – and a very untraditional ingredient, a bit of brown sugar. 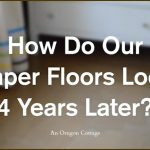 Wait – don’t leave! Trust me, I know it’s super odd to be adding sugar to stuffing, especially when we’re trying to cut down on sugar. But I promise it makes this dish so much better that the normal stuffing – and again, it’s a once or twice a year thing, so this is the place it’s okay to splurge a bit. And so on – it’s not just me, this really is the best stuffing and I’ll never go back to regular old stuffing! 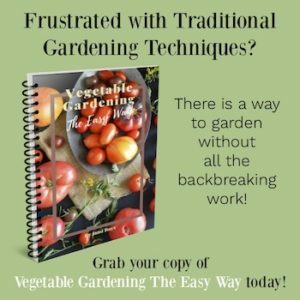 Please give it a try – it just might become your family’s favorite, too! 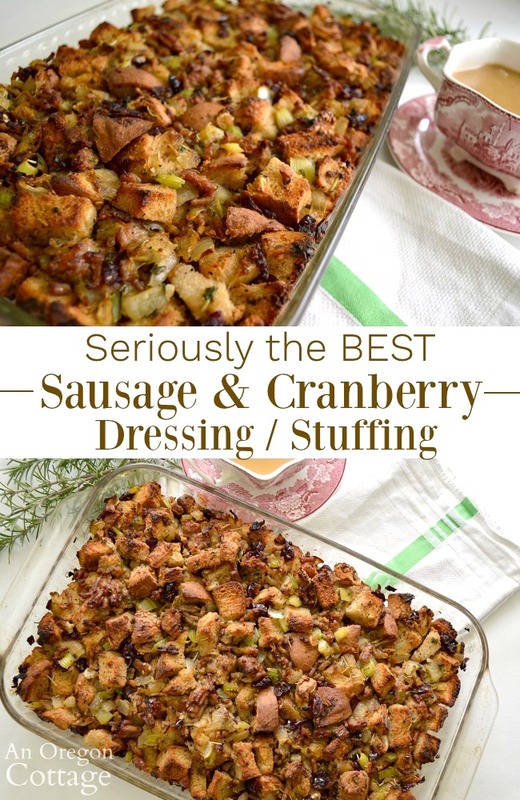 Click the arrow for the full Sausage Cranberry Stuffing Dressing recipe (with print options)! I made this for Thanksgiving and as with every recipe I make from your site, it was spectacular and we loved it. 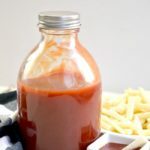 Can you make this in advance and freeze it? 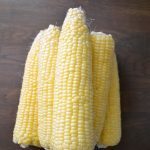 I thought I remembered a recent post about the items for Thanksgiving that are good candidates for preparing ahead of time and freezing, with directions for cooking it later, but I can’t seem to find the post. Thanks! TO MAKE AHEAD: Make the dressing/stuffing (don’t bake), let it cool and freeze in pan wrapped in plastic or spoon into freezer baggies. Thaw overnight. For a drier, fluffier stuffing, stir, place it in a baking dish, cover with foil, and bake until it’s done (remove foil for browning if desired). For a more moist stuffing, thaw, add a bit of extra broth, cover with foil and bake, remove the foil, and dot it with butter and place back in the oven to brown the top. I made this for our family’s Christmas dinner. 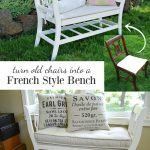 It had rave reviews! The only complaint I have is that my daughters took home the leftovers and didn’t leave any behind for us. Sigh. Sounds delicious to me. I LOVE cranberries in stuffing. And apples. I have to have apples. And nuts. 🙂 I’ve never made it with meat, though, so I’ll have to try yours. I made some last month with King’s Hawaiian bread. Holy moly, it was beyond delicious. I like real bread, too. None of that cubed crap. Ha!